In Aleppo, the capital of Syria, silences are rare and the sound of falling bombs hasn’t ceased since the war began five years ago. With much of the country in ruins by now, millions of Syrians have attempted to leave the country, crossing the perilous waters of the Mediterranean on nothing more than flimsy rubber boats to reach safer shores. Yet there are those who stay back. 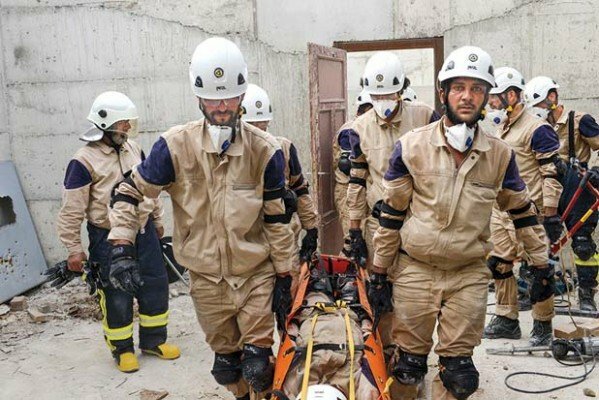 Equipped with minimal protective gear, often nothing more than the white helmet that has come to symbolise this organisation, these men do not run away from danger. They go in right after the bombs go off. They are the White helmets of Syria. Running on donations by international agencies like the US Aid and Dutch foreign ministry, the organisation comprises of the ordinary citizens of Syria- the bakers, tailors, carpenters, electricians etc. They’re a neutral organisation that does everything, from pulling out the injured from debris of destroyed buildings, burying the dead to conducting repair works and securing buildings. Their efforts so far have saved 56,000 lives. Khaled Harrah, a Syrian fireman working with the White Helmet organisation shot to fame when a video of him emerged- digging frantically through the debris of a bombed building while faint screams of a baby are heard from somewhere. Suddenly Harrah’s face emerges shiny with sweat, holding a very dusty but otherwise alive baby screaming with all it’s might. Jubilant cheers erupt off screen at the miracle. A tired but jubilant Harrah, holding the 10 day old baby. The video, a two minute grab barely reveals the ordeals of a rescue worker in a warzone. They dug for 16 hours through 3 meters of concrete rubble, constantly receiving updates on the position of bomber planes overhead. Whenever a plane came too close for comfort, they would hide, then come back and continue digging. This was also the group behind saving Omran, the 4 year old Syrian boy, who’s dazed face covered in blood and dust rocked the international community’s conscience just a few weeks ago. Omran Daqneesh was dug up along with his family by the White Helmets, just 10 days after Khaled’s death. Unfortunately, death does not distinguish between the victims and their rescuers. Over 130 members out of approximately 3000 members of the White Helmet have been killed carrying out rescue work in the war, and the numbers are only rising. Khaled was 29 when BBC news interviewed him in New York, travelling to Washington to apprise lawmakers of the horrific situation in Syria. Two years later, he was hit in the throat by shrapnel after one of the Assad regime’s artillery strikes in Aleppo. He bled to death while on the frontline. His story is one among many of the brave few who stay behind to save lives instead of fleeing danger. They are dying too along with the millions of victims they strive to save, with no one coming to take their place. And that is the real tragedy of this war. Writer, dreamer and observer. Can be found - drowning her sorrows in a cup of coffee.